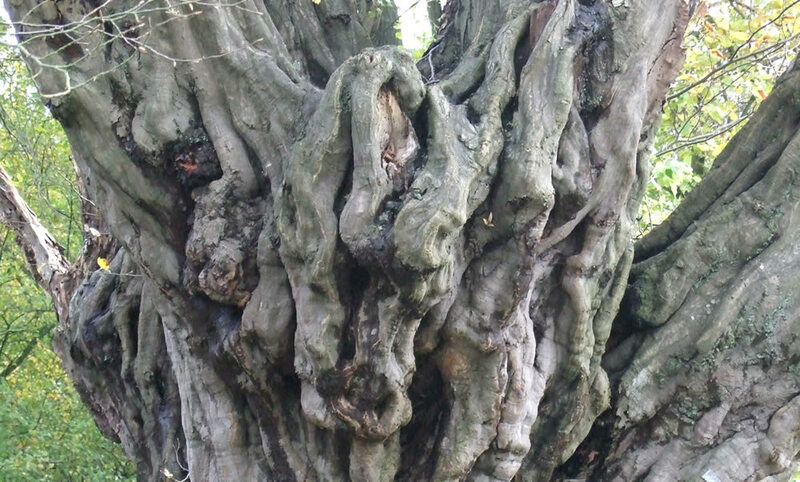 Ancient and veteran trees are ones that has developed some of the features so often found in older trees such as cavities, dead wood, and flaking bark. They may, however, not be that that old but have had a hard life and suffered damage from storms or man-made injuries. These veteran trees can also support some of the same wildlife found on ancient trees. An Ancient Tree is one that has passed beyond maturity and is old, or aged, in comparison with other trees of the same species. Its canopy may be small. It will probably have a very wide trunk relative to other trees of the same species and it is very likely that it will be hollow. Hollowing of the trunk as a tree ages is entirely normal and is not a sign of ill health and may, in fact, help the tree to survive longer. Dying ancient trees may endure for many decades and by still being present in the landscape continue the biological, historical or cultural connection as well as providing very valuable habitat. Ancient and Veteran trees are rare, as they age and hollow they provide cavities for some of our most charismatic birds, mammals and reptiles. There are many species of fungi, lichens and insects that are only found on these types of trees which are rare too. There is a complex web of life associated with these trees and they play host to many species. The best practice in managing sites with ancient trees is undertaken by our staff and we have great pride in being involved with some of the oldest trees in the country. As custodians of these trees, we at Tree Profiles Ltd will endeavour to use our knowledge and the experience we have gained over the years. We have attended Tree Veteranisation Courses and therefore can advise and carry out any necessary work to these types of trees. We carry out our services in Oxfordshire, Northamptonshire, Warwickshire, Buckinghamshire, and Bedfordshire we are a member of the Arboricultural Association; we have been approved by Trading Standards and are a member of Buy with Confidence.